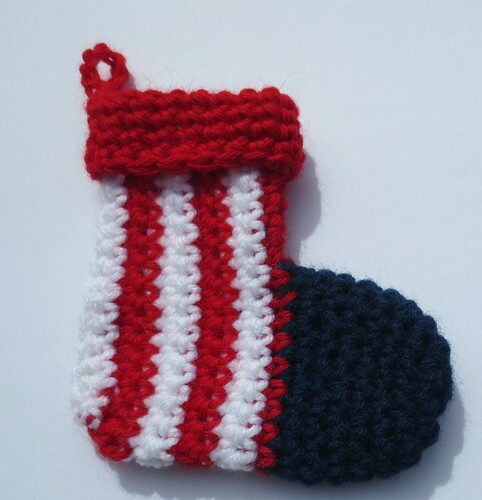 With the 4th of July just around the corner, I thought it would be a good opportunity to share some patriotic Christmas stockings that I crocheted for the Warmth for Warriors. Each year we handcraft mini Christmas stockings for the troops and fill them with little items such as soaps, shampoos, chapsticks, candies and other little goodies. The mini stockings are then given out to the troops as little Christmas gifts during the holidays. These little stockings might not seem like much, but we are told they are well received. The mini stockings filled with goodies are a wonderful way to say thank you to our troops and give them a little Christmas cheer during the holidays. I played around with a few mini Christmas stocking patterns to come up with these patriotic themed socks. The stocking on the left is a cuffed Christmas stocking of mine and the other is a variation of this crochet pattern.